We are one of the reliable companies in this domain and are offering Silicone Coated Fiberglass Sleeves. Owing to our immense market knowledge, we are able to offer excellent quality Fiberglass Sleeve. Having carried out every single test over the quality of these products, we ensure a best fit range of Silicone Fiberglass Sleeve. Max Withstanding Temperature: 550 deg.c. Fiberglass sleeving is treated at high temperature with a special kind of silicone resin and possess outstanding a temperature classification of 200 It also has excellent properties of self-extinguishing and flexibility. 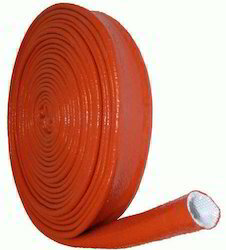 Silicone fiberglass sleeving, woven as sleeving by non-alkali fiberglass and coated with silicone in high temperature. It has excellent dielectricity, automatic quench and softness, widely used in the insulation protection of internal line cluster in H&N machinery, household electrical appliances, electroheat device, special illuminations, TV set and electric instrument.